Guitar World is here to help you find savings on guitars, pedals, amps and everything in between! Yes, remarkably enough, it is indeed that time of year again. We have arrived at the yearly shopping extravaganza that's come to be known as Cyber Monday. Deals are everywhere to be found, and the music instrument world is no exception. 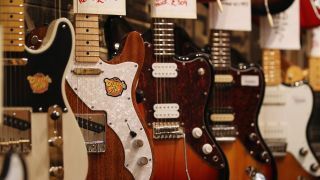 Every year it seems, the number of tantalizing sales for guitarists grows much larger, to the point where it can be quite overwhelming if you're not sure where to start looking. This year though, Guitar World is here to help you out, so you can do more online holiday shopping from the comfort of your computer, and less time listening to Michael Bublé (or Def Leppard) croon Christmas carols through your local mall/retail center's long-shattered speakers. How exactly are we going to help, you might ask? Well, we'll be scrounging the web for the best deals on music gear over the next few weeks. We’ll be updating our Cyber Monday deals pages regularly, and keeping you posted about discounts that'll kick your GAS into high gear. Last year, heavy hitters such as Amazon, Sweetwater, Sam Ash and Guitar Center were offering, at times, discounts of over 50 percent on certain products, with Sam Ash even lowering its 2015 Gibson Les Paul Special Double Cut price from $1,832 to $579. This year, even more retailers are set to get in on the act, with many offering additional discounts at checkout. So, if we see it online, we'll be the first to let you know! While we'll do our best to bring you the most irresistible deals, there are some shifty folks out there online who'll do their best in trying to cheat you out of your hard-earned money. Make sure your anti-malware software is up to date, as a motley crew of phishers, fraudsters and scammers will also be looking to target holiday shoppers. In addition, some manufacturers have been known to inflate their prices just before the holiday season, to give the appearance of a deal being much more dramatic than it actually is. To that end, CamelCamelCamel is a good resource if you want to determine how genuine a sale is.